Based on Patrick Hamilton's celebrated stage play, Thorold Dickinson's (The Queen of Spades, The Next of Kin) Gaslight (1940) is a harrowing and claustrophobic study of murder, abuse and lust in Victorian London. Unseen for many decades, this newly remastered version of Dickinson's psychological classic is available for the first time on Blu-ray and DVD, released with a host of extras in a Dual Format Edition on 18th November 2013 as part of the BFI's GOTHIC: The Dark Heart of Film. By turns charming and cruel, Anton Walbrook (The Life and Death of Colonel Blimp) excels as the sadistic husband who attempts to drive his wife (Diana Wynyard) mad to prevent her disclosing his dark past. The success of Gaslight on stage and film encouraged Hollywood studio MGM to buy the remake rights, with a clause insisting that all existing prints of Dickinson's version be destroyed. Fortunately, Dickinson had made a 'secret' print, which was donated to the BFI and used for reference when the film was digitally remastered by the BFI National Archive. 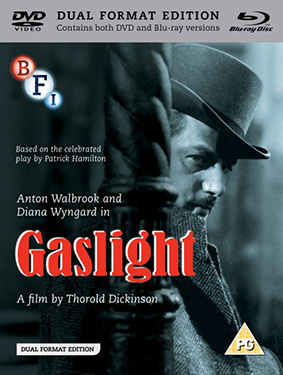 Gaslight will be released on UK dual format (including Blu-ray and DVD versions) on 18th November 2013 by the BFI at the RRP of £19.99.